This dashing check design features an ornate letter 'D' encircled with decorative scrolls. 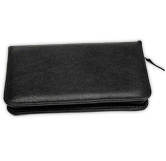 It's an elegant addition to your purse or pocketbook that adds personalization and sophistication. Turn your checkbook into an elegant fashion accessory when you start using this stunning selection. You can order this ornate selection in any of the 26 letters in the alphabet - from Abrams to Zalinkski! These checks feature a subdued beige background. But you can also add different monogram styles in the top-left corner on any of our other personal check designs. Get your D Monogram Checks from CheckAdvantage now. Matching address labels are also available.